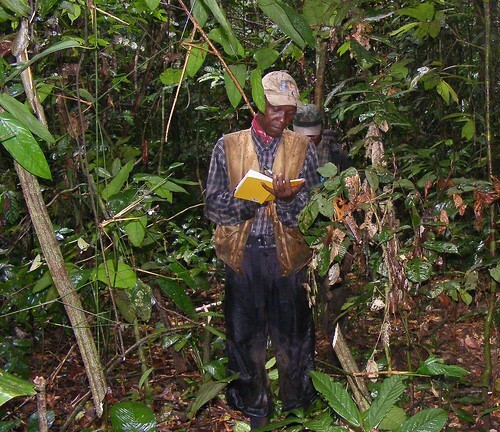 Searching for Bonobo in Congo » How Many Bonobos Live in the Forest? How Many Bonobos Live in the Forest? Example: Imagine you dive into a murky sea. You are counting a certain kind of fish; you must identify a particular flash of bronze in the mix of silvers and blues. A brief glimpse and it’s gone into the depths. If you swim a straight line, or a series of straight lines, is there a way of estimating the total number of these fish in the sea just by counting those brief glimpses? Apparently yes – but not simple. Map 1. This map shows the vast region, framed by three rivers, about which we knew so little. 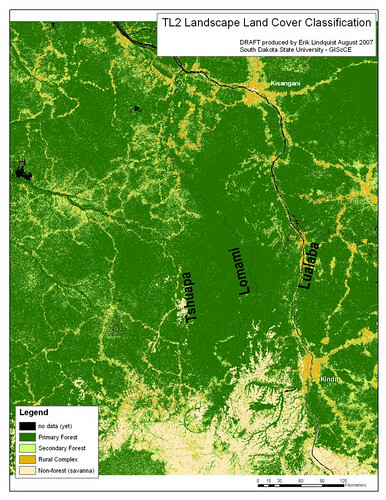 At the outset we defined an area of over 40,000 km2 centered on the Lomami River and bounded by the upper Tshuapa watershed to the west, and the Lualaba Congo to the east. We baptized the area, TL2. At its most basic, a line transect is a compass-oriented line of travel, from one defined point to another, along which observations are made, counted and measured from where they occur to the line. Line transect counts require an approach to observation that is premised on the assumption that we are most likely to see what is close to us and less likely what is farther away, and, crucially, that we see all that is located directly in front of us, on the transect line. Dino taking notes while leading a transect team. Easy to imagine that visibility drops off quickly in this forest. Line transects allow population density estimates – in the sea or in the forest. 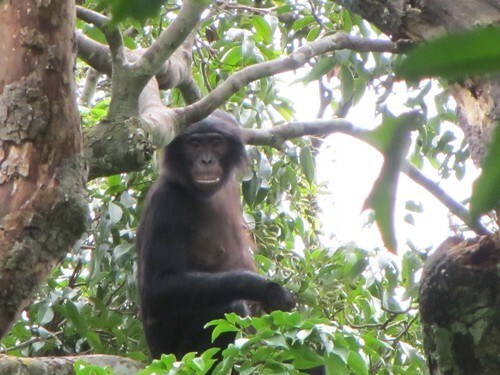 This post describes how we designed our bonobo transect surveys, where we placed them in the TL2 forest and what we looked for while walking the line. Walking the line – where and how many? Many decisions are made before work begins. Where will we put the transect lines, how many? The number or intensity of line transects in an area is “survey effort”. Survey effort is expressed as the number of lines per area or their total length (km) per unit area. The first important decision for our survey is to define the forest region that constitutes the survey area. How far can we extend our results and conclusions? Wherever we extend them it is with the assumption that the conditions that affect animal numbers are the same as those that we found in our survey area. 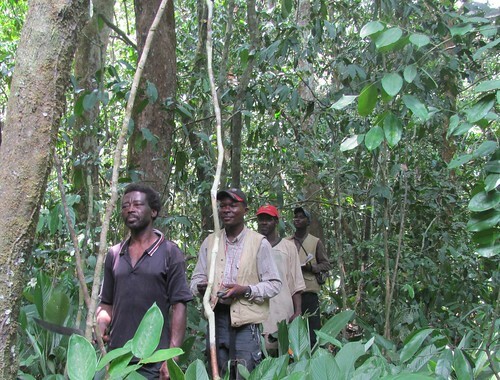 Unfortunately hunting intensity varies, forest composition and bonobo food plants change – so, always, the preferred solution is to conduct more surveys, put out more transects to cover more area. Once we decide on our survey area, we need to decide how to deploy our survey effort (design). This is always constrained by availability of time and resources to conduct the fieldwork. Thus a good design is a compromise that provides the most reliable results possible within the known project limits. The first objective: Un-biased survey coverage that is “representative”, meaning it provides results that correspond with the true locations and numbers of bonobos. We want to know the way bonobos are distributed: widespread at low density or aggregated. A good design should take into account information we already have such as the locations of favored or avoided habitats as well as the occurrence of human influences such as hunting. Map 2. We use reconnaissance surveys or “recces” to cover large areas quickly and give a first overview of where different animals and human activities occur before setting up a transect design. This map shows hunting sign along recces in the first exploratory phase of the TL2 surveys. We do not want our survey to inadvertently cover areas with more animals and avoid areas where they do not occur. We generally survey other species along with bonobos and each species is affected differently by habitat and by humans. Our best option is to place our transects either randomly or systematically, with a randomly selected starting point. This way we cover the survey area so that any point within its limits has an a priori equal probability to be covered by a transect. The survey results of this design are representative and can be analyzed statistically. Map 3a. The line transects that we followed in the southern bonobo sector and in the central elephant sector of the TL2 landscape (see NOTE 1 below). The second objective: A design that provides results sufficiently precise to answer our question: how many bonobos in a given area? The most important factor affecting the “survey effort” needed for precision is the variability we encounter in our observations. Highly variable results require more effort to reach acceptably precise estimates. Since our transect lines are a sample of many possible locations, we use statistical power analysis to estimate how large a sample of transects (how much effort) is needed to provide reliable results. We often base this on information from earlier surveys or a preliminary data set. See Map 2. Our approach to precision has some analogy to pixel density in a photo. Small pixel size gives a fine image, but we need a lot of these pixels to get the entire picture. Sometimes a coarser image is adequate. In sampling, the more we look and the finer the grain of our search, the more precise our results will be. But high-density coverage takes a lot of effort. It may not be possible to deploy that over an entire survey area. What we really want is efficient coverage that allows us “to see the picture” at sufficient resolution. Walking the line – what we look for and who looks for it. We would like to count bonobos themselves. We seldom see them, but that is not the problem. The real problem is we don’t know why we don’t see them more often. Is it because they are rare or are they just shy? Perhaps we pass them undetected or, they detect us and leave quietly before we are close enough to notice. As bonobos become more habituated to our presence in their forest we are likely to see them more often. 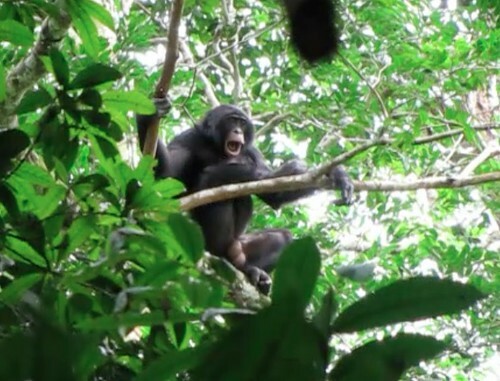 Thus differences in encounters of live bonobos on line transects may be a function of differences in their tolerance, not just in their numbers. All bonobos, except infants, construct nests each night, and sometimes nests to rest in during the day. Nests don’t move and observers can learn to consistently see them. 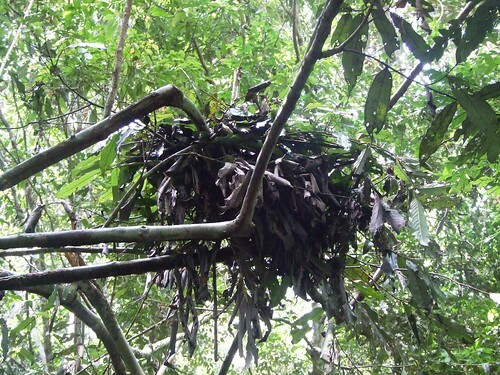 So rather than count bonobos, we count bonobo nests. We solve one problem, but we get another….how do we convert nest numbers to bonobo numbers. More on that in the next “How many bonobos” post. 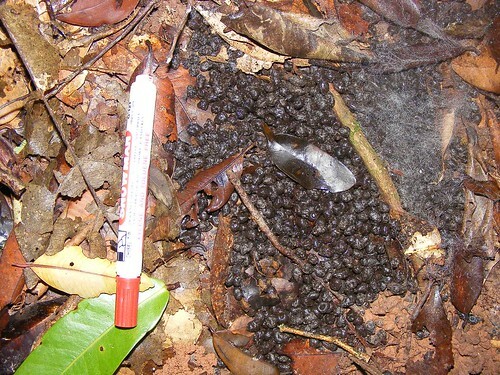 Duiker dung spotted on a transect line. Photos of all observations, allows them to be cross-checked later. Bonobos were a primary objective for our surveys ,but they are not our only concern. We want to be able to evaluate the distribution of other large mammals: elephants, duikers, pigs, monkeys and human activities. In TL2 human presence is detected by hunting sign. 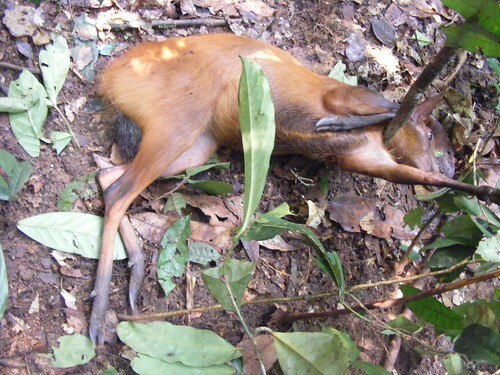 A black fronted duiker caught in a snare and still struggling. So along our transect lines, in addition to bonobo nests, we also count a wide range of other animals’ sign (dung, feeding, tracks). Monkeys we actually count directly. We measure distance to these and to indicators of hunting activity, including animal snares, hunting camps, active trail crossings, and spent shot gun cartridges. Because this requires a lot of attention, we walk the line with two or three observers. Henri is yielding the compass and GPS on this transect with pisteur in front and observers behind. Our field assistants are skilled naturalists; many are experienced hunters. When they are in the forest they observe widely and continuously – like any good hunter. They note the faintest rustle of disturbed foliage and split second glimpses of retreating animals. Though excellent in the forest, our observers need further training to tune their skills to transect lines. They must focus their skill on what is closest to them, both high and low. They learn to measure the distance to everything they see. This slows their progress, and the fact that they have to follow the line even if they are certain bonobos are somewhere else near-by, results in fewer sightings overall. But it is these very constraints that allow this protocol to evaluate to what distance we actually see animal sign in the forest. This is essential information to allow us to estimate numbers. Respecting the compass line — no matter what. Walking the line in the TL2 forest. Over the past four years we have used different designs for our surveys, depending on the area we wanted to cover and the focus of our inventories and the resources available. Our first and largest surveys took us over two years to complete and covered an initial area of over 40,000 km2 with three to five field teams out at once. We knew very little about the landscape and its fauna at the outset so we used a two-stage approach. In the first year, 2007, we covered as much ground as possible using compass oriented reconnaissance walks, called recces (see map 2 above). This allowed us to identify a core area of about 30,000 km2 that appeared still to have large mammals. In the second year we initiated the line-transect inventories in the core area (see map 3 above). Although with major interest in bonobos, elephants and hunting sign, our observers also followed duikers and primates. 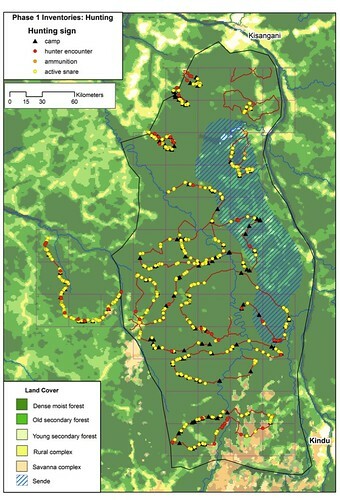 We used two designs for the line transect, one in the northern landscape where elephants occur in a circumscribed area but where bonobos are scattered and uncommon, and a second in an 11,000 km2 region in the south of the landscape that includes savanna ecotone, and where bonobos are frequent and widespread but elephants rare. A transect team is worth a good look even with a mouthful of Dialium fruit. OK so how many bonobos ARE THERE in the TL2 forest? That will be in the next “How many bonobos” post…. when John Hart, Scientific Director, once more explains how we look for answers. NOTE 1 for Map 3a. Our transect survey area covered 30,600 km2 divided into 34 survey blocks, 30 x 30 km (900 km2) each. 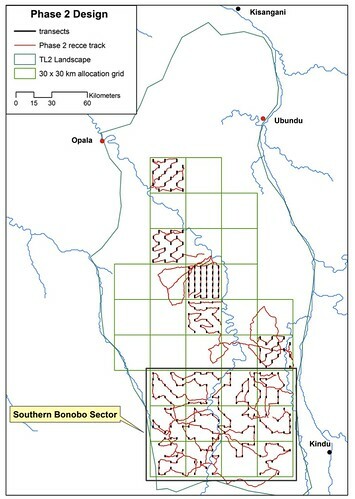 We used two different designs to lay out our transects: in the southern sector (12 blocks totaling 10,800 km2) where our exploratory recces showed bonbos most abundant, we sampled each survey block with 18 transects (shown in black), distributed randomly at the centers of 5 x 5 km grid laid over each block. 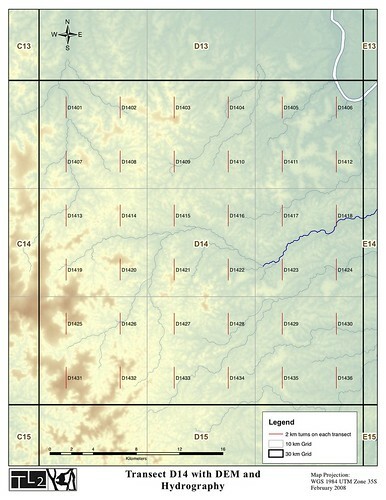 In the central TL2 (22 blocks, totalling 19,800 km2), we sampled 5 randomly selected survey blocks using a systematic layout of transects in each block. Field teams collected additional data on fauna and human activities on recces (shown in red) as they moved between transect locations. NOTE 2 for Map 3b. A detailed view of the transect lay out for survey block D14. In this case the transects are located at the center of a 5 x 5 km grid overlaying the block. This design provides us with a representative coverage of the block. Depending on design all transects can be used or a random selection can be sampled. This entry was written by Terese Hart, posted on 2012-03-21 at 1:46 pm, filed under Bonobo, Guides and how to. Bookmark the permalink. Follow any comments here with the RSS feed for this post. Post a comment or leave a trackback: Trackback URL. Great to learn something about your survey methods. So well explained! Looking forward to the next installment.